There are 43 good balls and only 6 bad. Pick good 6 balls to double your money and then keep on picking to win more. Careful to avoid the 6 bad balls though… and remember you can cash out at any time. To play Boss the Lotto, simply begin picking balls. You can touch each ball individually, or you can swipe multiple balls at a time. Good balls will reveal cash symbols. Once you have selected 6 good balls, the ‘cash out’ button is enabled. You can choose to cash out with double your stake or keep playing. When a ball is clicked, the RNG will determine whether the ball is good or bad. 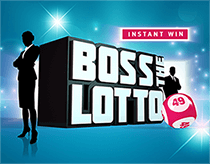 Boss the Lotto is a chance based game where the outcome is NOT pre-determined. This means that the players choices are meaningful within the context of the RNG calculating the odds of a given ball being good or bad.